Situated South of Crete, close to the beaches of Komos and Kalamaki, lies the quiet village Lagolio. On entering the village you will find our spacious villa with swimming pool and WiFi, situated against the mountains. This traditional Greek house was built about 250 years ago, over the last 100 years until 1960 the building was used as an olive mill. In 2006/2007 the house has been fully restored into a beautiful traditional Greek Villa once again. The villa can widely accommodate four persons. As well as panoramic views of the surrounding mountains you can also see the tops of the Psiloritis, the archeological site of Phaistos and the Mediterranean Sea. If you do not like the idea of being too remote but still would like peace and tranquility then here you will find the ideal place. The village of Lagolio is still in it's natural state thus untouched by modernization. In the village there is a very lovely restaurant which specializes in traditional home cooked Greek cuisine and the prices are so good you could eat out every day of your holiday there. The owners and staff are all very friendly and helpful and the atmosphere is excellent. Next to the house is a small terrace, a lovely place to have breakfast while enjoying the rising sun. The terrace borders the lower ground floor. You will also be able to see eagles, which regularly hover above the valley, the sight is absolutely breathtakingly beautiful. When you first enter the house you will find a spacious kitchen/dining area. The kitchen can comfortably accommodate six persons. You also have a wonderful view over the valley with its many olive trees. 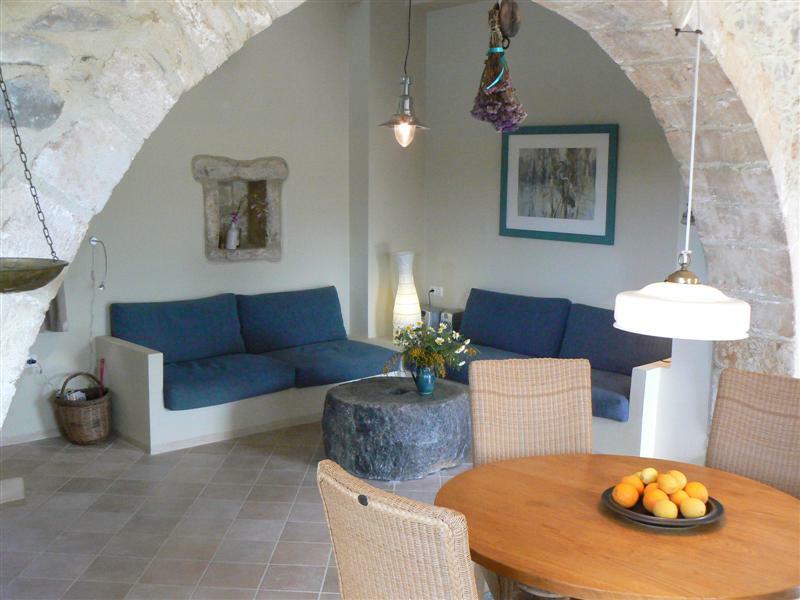 The kitchen is separated from the living area by a traditional arch (Kamara). The salon table is made from what used to be the old millstone. Here you will find comfortable twin beds, there is a children’s cot available if needed and there is air-conditioning in the bedroom. Looking out from this room you will see spectacular views. Taking a few steps onwards you will find to the left a door leading on to the terrace, then to the right is the bathroom, both these areas are decorated with the local Gortys marble. There is a shower. Toilet and washbasin, all amenities. Via another door you will enter another bedroom with double bed and this room also has air-conditioning. The spacious terrace leads to a private situated swimming pool. Comfortable garden furniture and umbrellas are also available plus a very handy outdoor shower. The swimming pool will be cleaned daily. Because of the sheltered location on the Southside of the Ida mountains, Lagolio belongs to the most pleasant areas on Crete, from burial sites to beautiful beaches which are very close by. All in all we can guarantee that you will have a wonderful holiday in our beautiful villa in a beautiful place.